Like a lot of stay-at-homes, I try to pretend that New Year’s Eve isn’t happening. My ploy just about worked yesterday, although I’m not sure watching “Scott of the Antarctic” was the ideal way to plod past midnight. New Year’s Day is much more my thing but, sadly, the endless rain has put paid to plans to go for a long walk and I’m beginning feel a little bit like Snoopy. 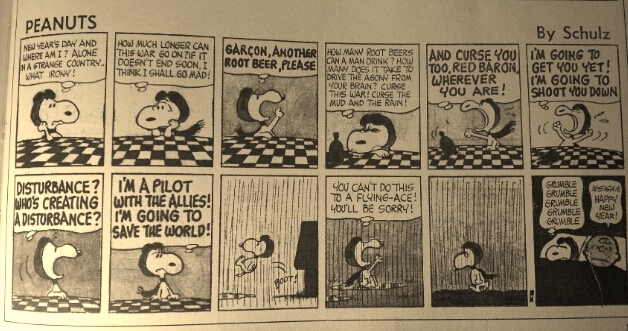 This episode of Peanuts, taken from my trusty copy of “The Penguin Book of Comics” – a tome I’ve treasured since childhood – must date from the mid-Sixties. It hasn’t aged a bit. Happy New Year, and thanks to everyone who follows this blog.